The Warehouse nightclub in Overhaugh Street, Galashiels. 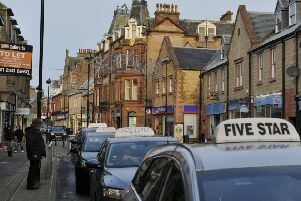 A reveller has been fined £250 at Selkirk Sheriff Court after admitting struggling violently with a nightclub employee. Aiden Fairbairn, 21, of Howden Road, Jedburgh, pleaded guilty to committing that offence at the Warehouse nightclub in Overhaugh Street, Galashiels, on June 30 last year. The court heard the accused had bumped into a fellow customer, resulting in drinks being spilled, and was told by staff that it was time to go home. Fairbairn refused to leave peacefully, however, and a door steward was injured during an ensuing struggle. As well as being fined, he was ordered to pay £100 in compensation to the door steward he injured.